This is a cake that we’ve been making in some form for around 15 years. The recipe was titled a “Little Debbie’s Cake” after the ubiquitous Southern snack cake. It tastes very similar to the snack cake cupcakes. The original recipe called for a mix and canned frosting. I adapted it to use a super easy homemade chocolate cake that comes together in about the same time as a mix and a homemade frosting as well. A bonus for this recipe is it contains no eggs so if you need a cake for someone who has an egg allergy this would work wonderfully. Your favorite snack cake flavors in layer cake form. Preheat oven to 350 degrees. Butter two 9 inch round cake pans and dust with cocoa powder. In a medium bowl, combine dry ingredients (flour through salt in the ingredient list). Add your oil, vinegar, vanilla and water. Mix until smooth and divide between pans. Bake for about 25 minutes or until fine crumbs are formed when tested. Cool in pan for 10-15 minutes. Remove from pans and cool completely. Whisk together flour and milk in a small saucepan. Cook over medium low heat until thickened, stirring constantly. Let cool completely. Once flour mixture has cooled combine it with shortening or butter, vanilla and sugar in a large bowl or in the bowl of a stand mixer. Beat with mixer on high for about 5 minutes or until light and fluffy. Set aside. Combine the butter and cocoa powder. Alternate the milk and cocoa powder until desired consistency is reached, adding sugar or milk by the tablespoon if need. Stir in vanilla. If desired split cake layers in half horizontally with a serrated knife. Place bottom layer topside down on plate. Top with all of your filling if making a two layer cake, use 1/3 if making a four layer cake. Repeat as necessary until all cake and filling is used. Frost as usual, slice and serve. Oh my gosh, that sounds good!! My house is still too hot to bake, though! No fair. I want some! This sounds DREAMY! I’m quite the chocoholic, so it will go on my list. 🙂 Thanks for sharing! Oh this looks delicious! Don’t judge me too much, but I LOVE the little debbie cakes, so this is right up my alley 🙂 I hope you can swing by to link this up to my Sweet Treats Party this weekend!! I pinned and stumbled this post and I like you on facebook now! I’d love a follow back when you get a second! Oh my goodness! For a chocoholic like me, this is so tempting. I’ll have to copy down your recipe. Thanks for sharing! Hey, sorry I’ve been slacking. I emailed you the FBF scipt! This looks amazingly delicious. I love that you adapted it from boxed ingredients. I try not to use too many of those. This looks delicious! 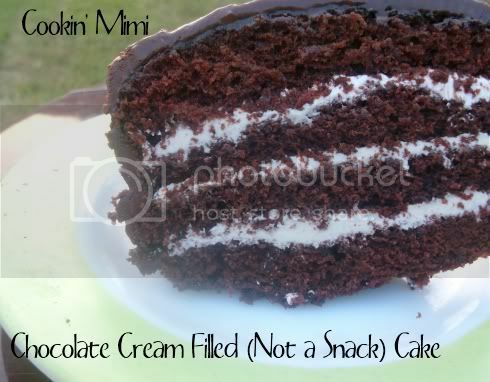 It is reminiscent of the Little Debbie Swiss Cake Roll, a staple here at my house. Delicious! Thanks for sharing on Sweet Indulgences Sunday. It is similar to a Swiss Cake Roll, which happens to be my favorite Little Debbie Cake. I just saw your post on Fat Camp Friday at Mangoes and Chutney. YUM! This cake looks fabulous. This looks like such a rich and decadent cake. Yum! Just wanted to stop by and let you know that you will be featured on this week’s Sweet Tooth Favorites. Stop by on Saturday and grab a button. I’ve also Stumbled your recipe. Hello! Stopping by to let you know that this was one of the top recipe on Sweet Indulgences Sunday last week. Hope you’ll stop by this weekend and share another recipe. Just wondering if you think this would work in cupcake form to make it easier for a potluck type situation? Most likely. The cooking time would be a bit different of course but I don’t see why not.